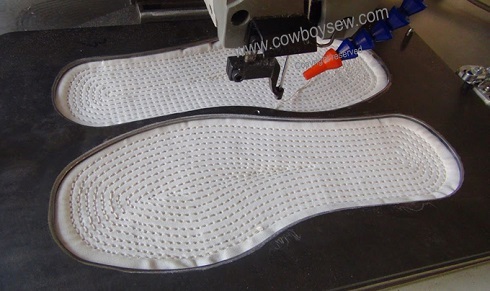 For over 10 years, CowBoy / Hightex Sewing Machine Co., Inc. has been designing and manufacturing high quality parts and supplies to the world's shoe industry. We take pride in offering the same high quality products, superior service and competitive pricing via the Internet. Hightex 7273CNC-S2S custom made automatic shoes soles stitching machine: This programmable pattern tacking machine is designed for the sewing production of shoes sole made in layers of clothes, cottons, leather, rubber, and other fabrics. The closed-loop control system ensures consistent production output quality from different thickness of soles. Tailor-made clamp guarantees precise stitch formation. This automatic sewing equipment is great for labor saving, one worker can operate 2 sewing machines at same time. Hightex MLK300-6040 Automatic programmable pattern sewing machine for decorative seams on shoes upper: This automated sewing equipment features in large sewing area (600X400mm), allow to make sewing pattern on large panel such as safety shoe upper, safety boot upper, leather bags etc. Also it can sew multi shoes upper and other small leather goods (like hand bags, wallets) together by one time, great for saving labor cost. CowBoy 7618 Heavy duty compound feed walking foot leather and upholstery sewing machine with binding set: Compound Needle Feed, Walking Foot (Unison Feed) Lockstitch Sewing Machine with a Big "M" size Bobbin and Rotating Hook, (end loading mechanism). Additional features include a Safety Clutch mechanism, Dial operated stitch length regulator, Reverse feed lever, semi-automatic Lubrication and sews up to 7/16" thickness. Hightex 72593 Wheel feed, needle feed and driven top roller feed machine for sewing production of shoe and leather goods: One of the hallmark features of the 72593 is that it features a "free sewing" capability that allows the operator to sew in any direction free of the control of the wheel feed. Its Positively Driven Roller Presser provide a powerful feed for the materials which are hard to feed and climbing stitches over thick section, and ensures constant stitch length and smooth material feed. CowBoy CB4500 Heavy duty leather sewing machine with synchronised binder for binding shoes and thick materials: It is vibrating binder attachment and due to this feature, a beautiful tape binding finish for heavy materials or elastic tape can smoothly and easily be performed. This movable binder kit can work with Juki TSC-441 leather stitching machine. Hightex 9517UL heavy duty zigzag sewing machine for shoes and leather goods: High speed walking foot zig-zag fancy stitching machine for assembly and topstitching seams on leather. With large rotary hook and automatic thread trimmer, idea for assembly seams, decorative seam, shoe lining and heel seam in shoes and boots. Cowboy 801 Leather Skiving Machine: A skiving machine is designed to bevel the edge of leather and rubber like textiles. For Skiving the edges of leather in order to fold or piece leather together. For Horn Wraps, Saddle Work, Boots, Shoes, Apparel, Bags, etc.